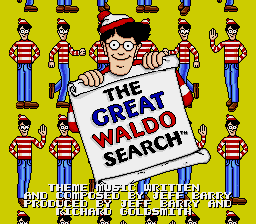 The Great Waldo Search is a 1992 search game based on the 1989 book of the same name by British illustrator Martin Hanford. The game was produced by American-based developer Radiance Software and published by THQ for the Nintendo Entertainment System, Super NES and Mega Drive. The player is tasked with finding Waldo, a man with a red-and-white striped shirt and cap, along with a scroll for the Wizard Whitebeard, in each of the game's five levels. The levels themselves—The Battling Monks, The Carpet Flyers, The Unfriendly Giants, The Underground Hunters and The Land of Waldos—are each based on pages of artwork from The Great Waldo Search book. Players use the d-pad to move a magnifying glass across the screen, scrolling left and right. Holding down the button increases the scroll rate on the magnifying glass. To find an item, place the magnifying glass over the object and press . If it is an object, the player will get the item; if not, a buzzer will sound and the level's timer will decrease. Pressing pauses the game, with the level out of view. In addition to Waldo (worth 1500 points) and Whitebeard's scroll (worth 1000 points), there are other objects available for the player to find. Locating Woof, a dog wearing the same red-and-white pattern, as Waldo, opens a minigame where the player flies on a carpet, collecting bones worth 100 points each. 150-point tiles give the player an additional 150 points. Locating a clock increases the time left on the level. However, some clocks give a clue for the player to find an additional item (a man with a red beard, a soldier with two spears, etc.) Finding these clues gives the player 750 points. Any extra time at the end of the level earns additional points. The game has two modes, normal and expert. In expert mode, objects are more well-hidden, and clocks with clues give one text clue instead of having the clue over audio clip. Completing all five levels ends the game. Main article: The Great Waldo Search/Magazine articles.